Experts from the New England Journal of Medicine and ABC News are warning that this year’s flu vaccine may only be 10 percent effective. But that doesn’t mean you should give into the flu without a fighting chance. Deb Group offers tips to stop the spread of the seasonal flu. Re-learn how to wash your hands. According to a study done by Michigan State University, only five percent of people wash their hands correctly. This year, encourage yourself, coworkers and others to wash their hands properly. Make sure to wash your hands for at least 20 seconds (try singing the chorus of a favorite song twice), and scrub all areas of the hands, including under the fingernails, in-between fingers and the backs of the hands. Hands should be rinsed and dried completely with clean, disposable towels. Use a paper towel to open doors. After hands have been cleaned, the last thing you want to do is contaminate them by touching a dirty door knob or light switch. Using a dry paper towel to touch high-touch surfaces creates an effective barrier, ensuring hands stay clean well after they are washed. Hand sanitizer placed at desks and near entryways and exits in the workplace encourages employees to use it throughout the day when soap and water isn’t readily available. 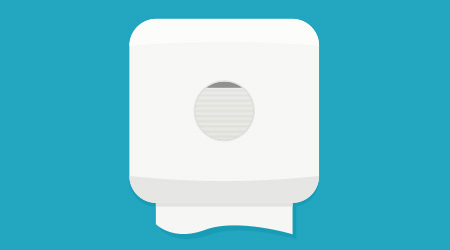 Whether it’s a sticky note on your cubical or a digital reminder on your computer screen, keep tabs on your hand hygiene throughout the day by leaving behind helpful reminders to wash hands a few times a day. Did you know that most workspaces have hundreds more times bacteria than a toilet seat? Even if your office is regularly cleaned, make sure to wipe down your computer keyboard, mouse, pens and desk regularly. It only takes one sick coworker to cough or sneeze near your desk to contaminate your workspace. “During the peak months of cold and flu season, it’s crucial to enforce an effective hand hygiene program to help keep the workplace as clean and healthy as possible,” added Faivre.